Sinclair centers his identities as a Black male as he speaks with us about his insights as a newer professional in Student Affairs. He shares strategies to practice mindfulness in daily Student Affairs Work. Sinclair offers tips to maintain personal and professional balance, to exercise control over his daily energy expended in his work on campus, and a mindset for thinking about workload. Sinclair spent his early years with the Jesuit Volunteer Corps NW where he learned about injustice and acquired language and frameworks to respond. Listen in for his perspective on contributing when invited to the table, not in spite of our race, gender, and social identities, but because of these identities. 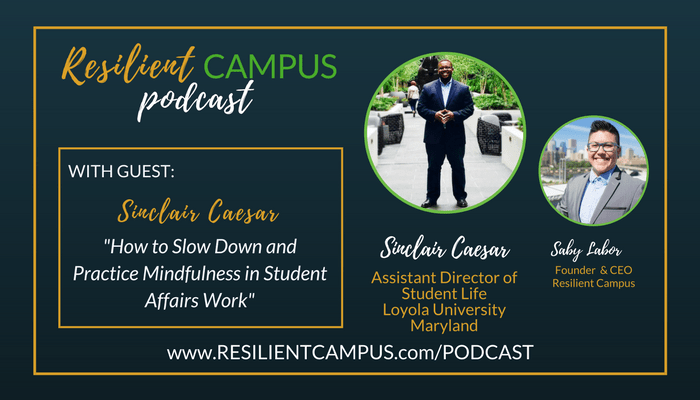 Sinclair Ceasar is an Assistant Director of Student Life at Loyola University Maryland. He lives on campus with his wife, Tynesha. He has several years of experience with residence life and social justice work. Sinclair enjoys doing improv in Baltimore, doing speaking engagements at various colleges and universities, and sending weekly inspirational emails at The SA Pro Next Door. Subscribe here to receive resources to grow your student internship program. Success! Thank you for investing in student interns. Now check your email to confirm your subscription.